Round 3 – St Kilda v Adelaide Crows: Fans, Entitlement and Expectation: Searching for some meaning in football life. Luke, the Saints supporter, in Adelaide gear. Photo by Melanie Inglis. Before Saturday nights game, I had a good reason to feel enthusiastic. My drafted grandson Luke and his friends would be playing in the Auskick at half time. No matter what else was happening, Nanna Yvette had something to look forward to after a bleak few weeks of footy. I had my mum’s opera glasses to see across the field, and had spent a pleasant afternoon meandering into town. Surrounded by friends and family, I had little expectation of a St Kilda win. Half time seemed a pretty good consolation prize. The first half of footy the Saints were in the game, just. With Saints 3.9 to Adelaide 5.7, it wasn’t a blow out, yet. But our behind tally was once again killing the Saints confidence and the fans mental health. We were ready for Luke and his buddies, even if he was disappointed to be draped in Adelaide colours. Luke’s Mum, Danielle, came down to join us, only to find that Luke was playing in front of the players benches on the opposite side. The opera glasses came in handy for me. And her friend took photos from the other side. I watched the children play, with enthusiasm. 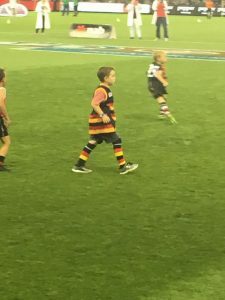 They were on the big oval, for Luke, the first time at a half time event, and because of the growth of Auskick, the only time he’d be on the field this year. I got all the good things in life in the 20 minutes he ran up and down the field. 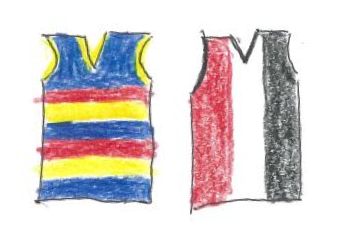 Even in an oversized Adelaide jumper, Luke was having a go. The rest of the adult game was a huge disappointment, and it was hard to get any enjoyment or positivity from the night out against the Crows. As fans, we bore the expectant result, and the week of analysis and discussion. And it got me thinking about being a fan, having expectations and a sense of entitlement to success. I looked up the terms. Definition of fan: a keen and regular spectator of a (professional) sport or supporter of a (professional) sports team; a devotee of a specified amusement, performer etc, an enthusiast for a particular person or thing. Fan is an abbreviation of Fanatic: inspired by a god, frenzied…a mad person; a religious maniac, a fanatical person, a person filled with excessive and mistaken enthusiasm, especially in religion. Definition of entitlement: to give a person or thing a title, right or claim to something, furnish with grounds for laying claim. Definition of expectation: the act of expecting, a thing looked forward to, a prospect of future good, success, or profit. I am a keen and regular SPECTATOR, and I watch OTHERS do the hard work and make the effort to determine a score, so I can feel good. (Or not so good.) I am amused, entertained, enthusiastic and am of the fanatic leanings: a person filled with excessive and mistaken enthusiasm. And I caught myself feeling ENTITLED too, we should have the success, we were promised SUCCESS, the Saints mantra of Finals by 2018, Grand Final by 2020. Even if Saints go on to win the next 10 games, the first three have left fans howling for blood, of coaches and players. Of the Club and administration. Fan chat sites are full of angst, and then some who run the sites asking everyone to chill. The Saints motto is Strength Through Loyalty. So keep the faith, they ask. As I try and understand the range of emotions both within and without, I had images of fans baying for blood at the Colosseum, urging those Lions on. I had images of old ladies knitting at the guillotines, being entertained by someone else’s pain. I think the poor crowd on a Saturday night affects sponsors and future members, and the Club’s thrust to get to 45,000 members in 2018. I think of all those workers at the Club who put out all the releases and deal with memberships, the staff who are attempting to make the Club a financially stable place in the face of the move to Seaford and the glorious return to Moorabbin. I think of righteousness of fans and the pressure to livelihoods of those who coach or those who play. I think of my own narcissism, of wanting Saints to play well so I can feel satisfied. And I’m not the one with bruised and sore body and I’m not the one listening or trying to ignore being told you need to be traded, fired, dropped or retired. As a fan, I am wanting a group of young men (and women) to make me feel better by winning a game I have no physical skin in. I want them to do it for themselves, but really, I want the pleasure and want that premiership poster hanging in my house. I want to walk around proud as punch like the Doggies supporters and the Tigers supporters. I want an Almanac dedicated to St Kilda victory. I WANT. Classic narcissism. I Want. Do something for me. Make me feel better about the team I have chosen. Make me a champion by being a champion team. Give me glory. Give me victory. Give me your blood. I am horrified if I think of a future where Luke is under the kind of pressure that football players have. Where he may lose the love or enthusiasm for the game, the confidence to play it, to will to fight on. I am horrified to think I am one of the many who are burdening the players with my expectations, fandom and entitlement. I have decided to dial it back. Reclaim my expectations and try and be the best fan I can be. I will offer STREGNTH THROUGH LOYALTY and support my team and the players, and the Club and its members, because they give me the only thing I am entitled to: a place within a community of others who love the red, white and black. Wonderful piece of writing and self- analysis of being a fan. When the Bulldogs crashed in the first two rounds, I too asked myself why I put myself through the agony of being a fan. Fortunately I had a poster on the wall that reminded me of the fairly recent premiership. But then the ‘Danny from Droop Street’ side of me reappeared and I was telling people it would probably be another 62 years before the next premiership. I was so jealous of the Geelongs, Brisbanes and of course Hawthorns with their ‘golden eras’. We had a golden ‘year’ only. Winning on Sunday made being a fan all worthwhile, particularly seeing the club united after all the scuttlebutt. When the Saints are settled in Moorabbin it will kick-start their revival. Thanks Neil. It’s funny how quickly we turn into victims of this mind set. Doggie glory was two short years ago and still there’s want for more and eras and greatness. Maybe once your team has one another set of expectations hit… three peats! It’s obviously a problem with a wider diameter than football Yvette, this ‘more more’ business an d’now!’. But such an excellent vocation to examine our own backyards or footy fields after all … I really appreciate your laying out of the thoughts that form that web of expectation and entitlement. There is much to think on. Merci. Thanks for the insight, Yvette! Many a time over the years – perhaps even more so now – I question WHY? Why do we get so emotionally involved in a sporting team and its success or otherwise? And apart from the I WANT mentality, to allow results to affect us in such extreme ways. Madness it is! Thought-provoking piece about the absurdity of fandom, Yvette. To what degree do I have a right to demand good performance? How do clubs measure loyalty? My history with Collingwood binds me emotionally and I doubt that will ever change. However, I won’t be treated like a fool and sold bulldust either so that a rich clique can keep their jobs and identities in tact. I watched your Saints against the Crows and was expecting a closer contest at Docklands. Maybe a lack of leadership on field is affecting the team. Rooey’s retirement seems to have left a gaping chasm. I am with you as another passionate St Kilda diehard. In addition of your definition, as a footy player myself, I want my boys to be my on field role models, as they are supposed to be my hero. Giving me examples of don’t is not what I want. Matt told me not to worry too much at footy training. It would apply to support the mighty Saints as well as for pit boys, I think (indeed it was for my on field performances). Good writing by the way. Have a faith to the club for us. Loved this Yvette, I think you live in my brain sometimes because I feel all of this all of the time! Fandom is such a selfish thing – as much as it’s a about being part of a community and a tribe, it really is, as you so eloquently put – ‘all about me’. How your team makes you feel and how you feel as an almost representative of your team. it’s so personal. Thought provoking stuff. Thank you all for your thoughts and comments. It’s good to know I am not alone. When I wrote this, I wondered if I was losing it! And not just my team, but my fandom and mind. Writing it lifted a dark cloud of dread of the season ahead. Now I am trying to just float with it and hear the noise but not be so emotionally drained. The impact of the ups and downs is exhausting. To be invested in something we have absolutely no control over is madness. Fun madness if your team is going well, but not so much so when your team is struggling. I remember people saying at the Saints worst time in the 70’s and 80’s, people loved watching the individual champions playing. It was a matter of how much we’d lose by that week. There was never an expectation of winning, for 20 years! I came back on board in the 2000’s, and it was a charge up the ladder and into grandfinals. Then down we go again. Snakes and ladders with a footy. And yet we choose it, again and again….isn’t that the definition of madness folks? Thank goodness for the Footy Almanac site. It is my therapy and my community too. And here I can write, release and prepare to see what the week brings. It is also interesting that I have enjoyed two seasons of the women’s footy without being invested hugely in a team. I was a member of the Doggies both years, but was so excited overall that I didn’t have the ups and downs emotionally. It will be interesting to see what happens when Saints have a team in 2020. I do have a feeling that I will not be so negatively affected, as I will be so happy we have women playing. Who knows. Again, thanks for your thoughts and encouragement. Yeah, it’s a tough one Yvette, well expressed. Having watched this game I reckon St Kilda should be better than that but as you so well express, to what end that sense of entitlement? I’m much more able to deal with it at the local level with our footy club a minnow compared to most of our neighbours in suburban Adelaide. Our measures of success tend to be different – not expecting to win each week but looking for improvement, enjoying seeing a kid develop a new skill, relishing the upset victory over a bigger club. Mentally presumably it’s a much healthier approach to the world but I’m not sure how one gets there in the AFL. You will probably beat the Cats. Reasoned. Rational. A sense of wider perspective apparent. On a more serious note, I feel increasingly like the whole AFL men’s environment is in danger of eating itself, for the very reasons you hint at here. But then, if the Blues’ fortunes improved, would I change my tune? Fickle beasts, us footy fans. Really thought-provoking piece Yvette. And timely. Thanks. Much to consider. Does the narcissism apply to all professional spectator sports? Are we narcissistic cricket fans as well? Or what does the recent response to the SA situation tell us about sport more broadly and maybe footy in particular? I don’t care if the Australians win. But I do care how they play. The comment thread is as engaging as the piece. Sadly, I share Phil’s view. The con has been on for too long. It can go two ways I reckon. The game ruins itself. The game sees itself in a the image of some alternative. Because the things that made it will disappear if it doesn’t understand itself. Hey JTH, JB and Dave. This cricket season bought all our narcissism out. The outrage and hurt that our side could cheat. The shock and righteousness. We all have narcissism … it’s when we don’t check it at the door at certain times or we take positions that it’s too much. It’s when we saw the humanness of Steve Smith and co that everyone settled down and stopped baying for blood. I think you’re being way too harsh on yourself with your notion that being a fan is self-centred. (And I mean a fan, not a follower, which where the narcissism lurks). The fan’s primary characteristic, loyalty (the “fidelius” part of your club’s motto), is the exact opposite of self-centredness. First and foremost “fidelius” means sticking fast through thick and thin, which is anything but self-centred. “Fidelius” also implies forgiveness of others’ faults rather than demands of success. Sure, those faults might drive you to distraction at times but they’ll almost never cause a fan to walk away completely. Of course, you’re quite right that fan-dom is also a form of madness and so, I suppose it is self-centred that we allow ourselves to feel such unadulterated joy or gloom over essentially pointless and trivial things. But let me suggest an alternative view. Have a close look at the things that other folk choose to expend time, energy and emotion in this land of First World problems (shopping, home renovation, social media are a few that spring to mind) and tell me that they’re any less selfish than following a footy team. Have a look at the demeanour of such folk and tell me that they’re better adjusted than you or me. Above all, ask yourself whether the critical self-reflection on your experience of being a fan isn’t in fact something that many more folk should practice during lulls in their materialistic obsessions. Thanks Yvette – that’s a super piece of thought provoking writing. Great analytical and thoughtful writing Yvette. Hoping the saints can lift your spirit higher throughout this season. I greatly enjoyed reading this, Yvette. Very interesting. And I agree with your argument regarding entitlement. But there is also a part of me that recognises that fans go to the game to escape their everyday lives, to lose themselves for that two and a half hours, to believe and feel they are even just a small part of the game. Being a fan is a test of your own character. Or should I say that, in choosing to be a genuine fan, your character will be tested. Mine is. And what of criticism? Is constructive critique healthy? Constructive critique may only work if given directly. You and I could share constructive critique. When we critique from afar, and when many critique from afar, it sound more like collective howling at the moon. Stainless, you make an interesting argument about fandom being a better alternative than how others might spend their time. I love being a fan…I am questioning my right to demand something for that. Given that it is a game and someone has to lose, and there’s 18 teams in the competition, do I eat my own if they aren’t in the winners circle….again. Smokie…. I love footy as an escape and we are part of the game. We add to the fabric. I just don’t want to be an ugly part of a dark fabric demanding something that every fan wants. The players want it too. And coaches and staff. Yet one group walk away sated and the other denied. What I do love about footy is the trek to the train and all the angst left behind, two sets of fans meandering to our always confusing train system at Etihad. We become one that’s to public transport and the spirit of footy.